Tracy Do is thrilled to present the Hunter Residence, a stunning example of the Streamline Moderne style, designed by William Kesling, an innovative builder who was instrumental in bringing modern residential architecture to Southern California. 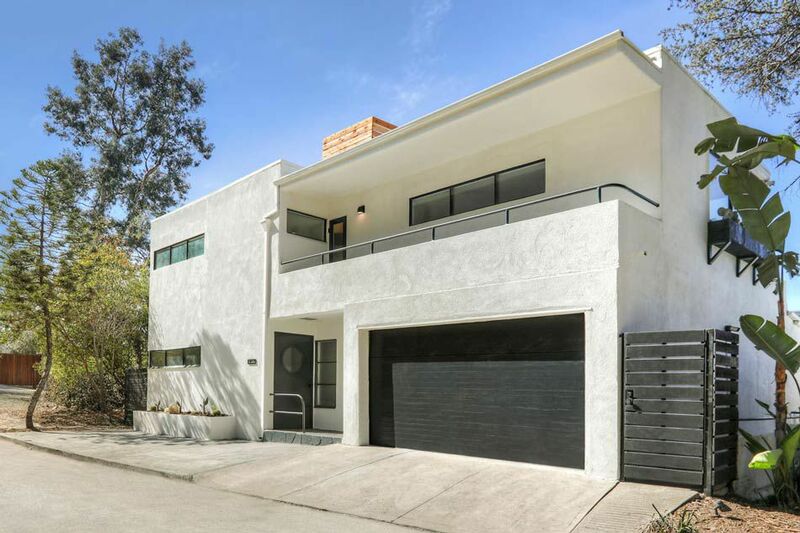 Built in 1936, this exquisite Silver Lake residence has been comprehensively renovated, bringing it squarely into the 21st century while celebrating its marvelous origins. The home was the longtime residence of distinguished 20th century philanthropists Nadia and Norman Kaplan, celebrated members of the Silver Lake community and founders of “Junior Blind” (now “Wayfinder”), a non-profit foundation devoted to providing services for people with visual impairments. Set on a large and verdant hillside lot, the home presents an elegant stark white facade. Long horizontal lines and a round porthole window serve as a subtle reference to the hallmark symbol of the late Art Deco style — the steamship — widely held as an emblem of progress and modernity at the time. An expansive living room is beautifully detailed with a geometric hearth, a row of street-facing textured glass windows that soften the sunlight, and sliding glass doors that open to the viewing deck, revealing a splendid panorama of the Silver Lake hills. The spacious kitchen has been entirely remodeled and updated with stylish cabinetry and all-new appliances, creating a sophisticated atmosphere that harmonizes with this architecturally significant home. Gorgeous hardwood floors flow throughout; system improvements include lighting and electrical upgrades, and more. A curving staircase transports you upstairs, where two ensuite bedrooms await, each with deck access and abundant light; the Master enjoys brilliant views of the Silver Lake Reservoir. A sequence of rounded walls, iconic elements of the Streamline style, usher you toward the second bedroom. All baths are manicured with tasteful finishes of grey terrazzo tile mosaic and artful fittings. William Kesling never received formal training as an architect, yet due to his unique ability to translate the popular civic building style of Art Deco to the private residence, he became one of the most active practitioners of the Streamline Moderne in Los Angeles. In 1934, Kesling founded “Kesling Modern Structures,” and managed to design the kind of modern home that people wanted to live in at a time when the general public taste gravitated to traditional styles of building. Kesling homes are coveted to this day; in the Hunter Residence you’ll find the very best of what history and the present can offer. 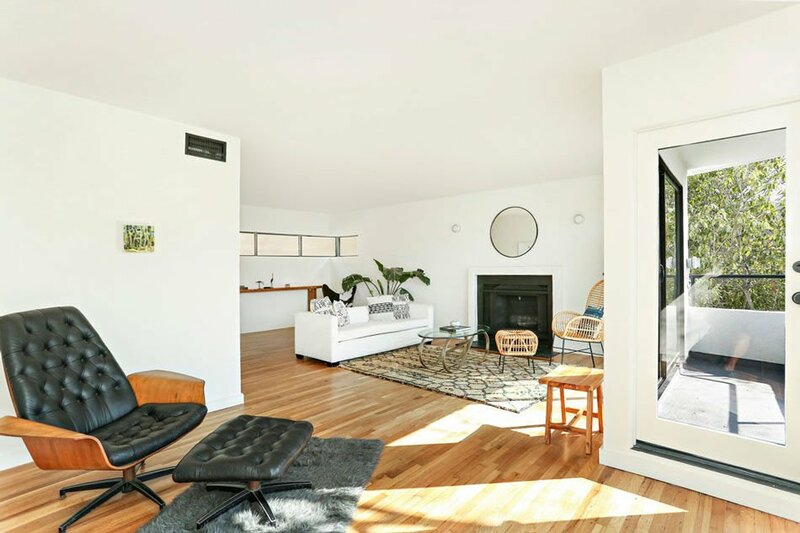 A whisper away from Silver Lake Reservoir and Sunset Junction, the home affords quick access to the Silver Lake Farmer’s Market, Sawyer, Cafe Stella, Intelligentsia, Black Cat, Pine & Crane and more. Trader Joe’s, Gelson’s and Whole Foods 365 are just minutes away. Saturday, Nov. 10: 2 p.m. – 4 p.m.
Sunday, Nov. 11: 2 p.m. – 4 p.m.